Posted by watercolorsandmore in art, ARt instruction, Art lessons, Art tutorials, art videos, evening sky, landscape, landscapes, painting, Patrick Ley Greaves, skies and clouds, Sunset, tips, tutorials, Uncategorized, watercolor, watercolor videos, watercolour, watercolour washes, Wet in wet. Painting skies and clouds in watercolor is an exciting prospect for an artist and the process is made easier by this video of artist Patrick-Ley Greaves. Mixing of colors, developing negative shapes, leaving edges soft and hard as well as working in wet in wet and wet on dry are some of the techniques one can learn from this demonstration. More of his videos at Patrick’s website. Posted by watercolorsandmore in art, ARt instruction, Art lessons, Art tutorials, Cathy Johnson, Drawing, figure drawing, landscapes, painting, sketching, tips, tutorials, Uncategorized, watercolor, watercolour, Wet in wet, Where do I start?. Posted by watercolorsandmore in art, ARt instruction, Art lessons, Art tutorials, art videos, art. 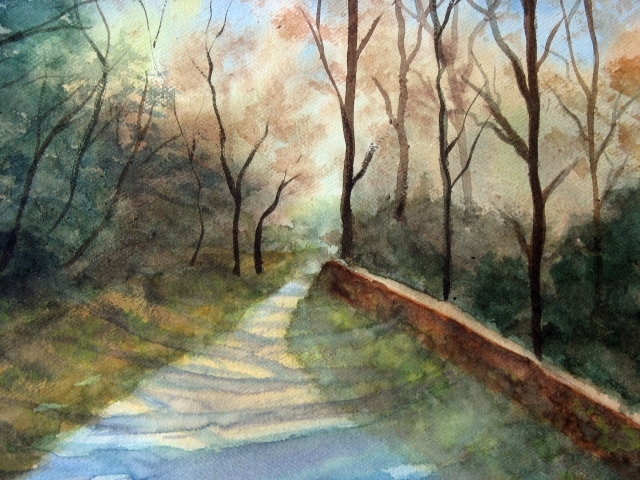 watercolor, Autumn lane, Drawing, forests, Geoff Kersey, landscape, landscapes, painting, painting and drawing channel, tutorials, Uncategorized, watercolor, watercolour, Wet in wet. This is an attempt of Geoff Kersey’s autumn lane. His video demonstration is available on thepaintinganddrawingchannel.com. Though my work is not comparable to the original and looks most part a lot of mud, I have so many positives to take from it and it has given me the confidence to improve further, and I hope to post an improved version later. The channel’s schedule for September includes programmes featuring artists such as Frank Halliday, Linda Kemp, Bente King, Richard Taylor, Jill Bays, Arnold Lowrey, Hazel Soan, and themes such as landscapes, botanical art, drawing workshops, painting buildings, acrylics and so on. So much in store for the art student. Posted by watercolorsandmore in art, ARt instruction, Art tutorials, art videos, art. watercolor, Drawing, landscape, landscapes, painting, tutorials, Uncategorized, watercolor, watercolour, Wet in wet. Want to learn by watching professional artists doing ? Take a peek at thepaintinganddrawingchannel.com. I have immensely benefited by their broadband live programmes broadcast at 4 p.m GMT on Mondays, Wednesdays and Fridays. Here is the schedule for the rest of August.